The North Sea still hides many secrets. 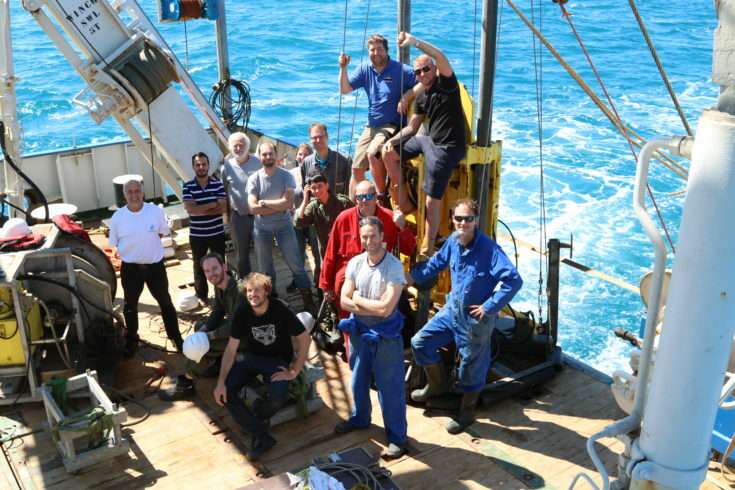 A joint team of researchers from the Royal NIOZ Sea Research, TNO, Deltares, Utrecht University and VU University Amsterdam set out on an expedition with the research vessel Pelagia to answer some questions that are moving researchers and society alike. Global change has unforeseen consequences for the ocean and human kind, in particular for those living in countries close to the sea and in parts below sea level – such as the Netherlands. “The North Sea holds some answers as to what might happen in the future on a global scale, because it is already happening or even has already happened in the North Sea”, explains NIOZ scientist and expedition leader Dr. Helge Niemann. Many of us only associate the North Sea with summer holidays, ice cream at the beach, dunes, wind-blown hair and sunsets at a light house on a barrier island. Encyclopaedias teach us that the North Sea is a marginal sea of the Atlantic Ocean, fringed by France, Belgium and the UK in the South, and Scotland, Scandinavia, Germany and the Netherlands in the North. The North Sea is a sea under transition with many offshore installations that have popped up like mushrooms in autumn: Harbour extensions, windparks and rigs pumping oil and gas from deep below the seafloor. It is the Dutch’s home turf that was already sailed by Frisians since antiquity and it is the sea from where the spiderweb of the VOC’s trade routes to Africa, South-East Asia and the Americas begun and ended. Many North Western European marine research institutes conducted expeditions to this rather shallow shelf sea, and one would assume that we know everything about the North Sea by now. In the central North Sea, the potent greenhouse gas methane seeps out of the sea floor. During the expedition, samples were taken to study its origin, how much is consumed by microbes in the water column and how much of the gas is released into the atmosphere. Warming of the Earth’s atmosphere is caused by elevated emission of trace gases such as carbon dioxide and methane. Although they only account for a tiny amount of all gases in the atmosphere (nitrogen and oxygen together make up 99% of all gases), they are for a large part responsible for the ever-increasing temperatures during the last century. Even worse, warming of the atmosphere will also lead to ocean warming. And in return, this could lead to higher emissions of methane from the ocean to the atmosphere where it further contributes to global warming: a vicious circle. How does this circle work? When planktonic organisms, minuscule algae and animals die, they sink to the ocean floor and are consumed by microorganisms that need oxygen (just as humans). In warm waters, these microorganisms are far more active than in cold waters. Their increased oxygen usage can tip bottom waters to oxygen starved environments. And then other microorganisms, which produce methane and don’t need oxygen can take over. Furthermore, the warming will also mobilise deposits of methane in surface sediments. “In the Arctic Ocean, sediments in shallow waters contain loads of methane, often locked in submerged permafrost. The propagation of heat from the water column into the sediments will melt the permafrost and mobilise the locked gas”, explains Niemann. But it is currently unclear how much of this methane will make its way to the atmosphere. 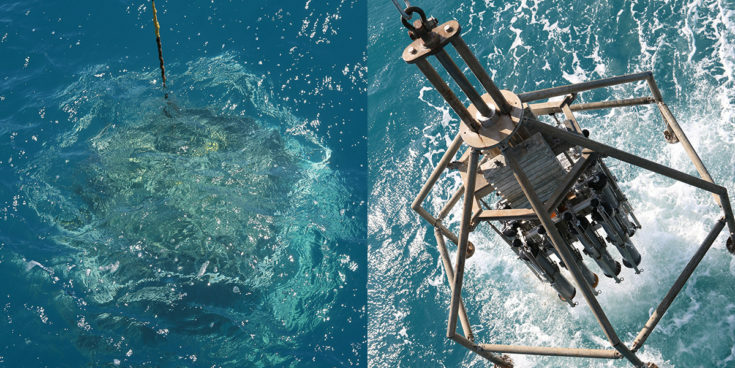 Once the methane bubbles come out of the sea floor, other microbes that live in the water column can make use of it as an energy source thereby mitigating the efflux of this potent greenhouse gas to the atmosphere. In the central North Sea spots are known where methane bubbles come out of the ocean floor. One of these spots is the flank of the Doggerbank, a sandbank in the middle of the North Sea, approximately 150 km North of the Dutch coast. Research Vessel Pelagia surveyed this area for methane release sites, which are visible on the ship’s echo sounder equipment. The ship was then “parked” above one of the bubble streams and the researchers continuously sampled the water column over a time period of several days to cover e.g. tidal and diurnal cycles. Also, the release of methane to the atmosphere was investigated. Samples were taken to investigate the origin of the released methane at the Doggerbank. However, it is clear that it cannot not arise from melting. The shallow water depth at Doggerbank and the multitude of environmental influences such as tidal currents make this site ideal to investigate the efficiency of the methane-eating microbes in water column. “With this knowledge, we can better understand if and how effective these microbes counteract methane release form the seafloor in a warmer, future ocean”, outlines Niemann one of the goals of the expeditions. These long-term sampling campaigns are typically not conducted during other expeditions because they are expensive, time consuming and also exhausting especially during heavy weather. But the participants of expedition 64PE-439 were lucky: the weather was calm and they could recover several thousand samples. For the scientists, the work is not over yet. 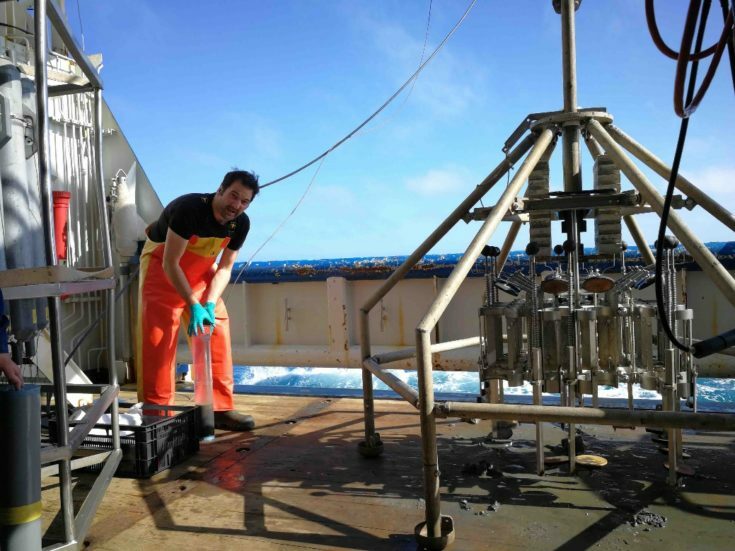 The samples are now waiting to be analysed for methane contents, microbial activity and diversity and these data will then be compared to current, temperature and other measurements of oceanographic boundary conditions. A second goal of the expedition was to investigate if the North Sea is endangered by oxygen loss in bottom waters. The Doggerbank in the North and land masses to the South and East almost form a basin, the so-called oyster grounds in the central North Sea. Although this basin is well connected to the rest of the North Sea due to a local gyre and the fact that there is an amphidromic point (point of zero amplitude of the tide) locally the water mass is relatively stagnant. High fluxes of organic debris from the sea surface could hence use up the available oxygen, ultimately making it difficult for the bottom life to breathe. The new measurements confirm earlier work which suggested that at least seasonally bottom waters become oxygen depleted. Increased productivity due to eutrophication and accelerated organic matter decomposition due to higher temperatures may play a role here. For future safe guarding of the ecological important oyster grounds it might be necessary to also monitor what happens at depth. 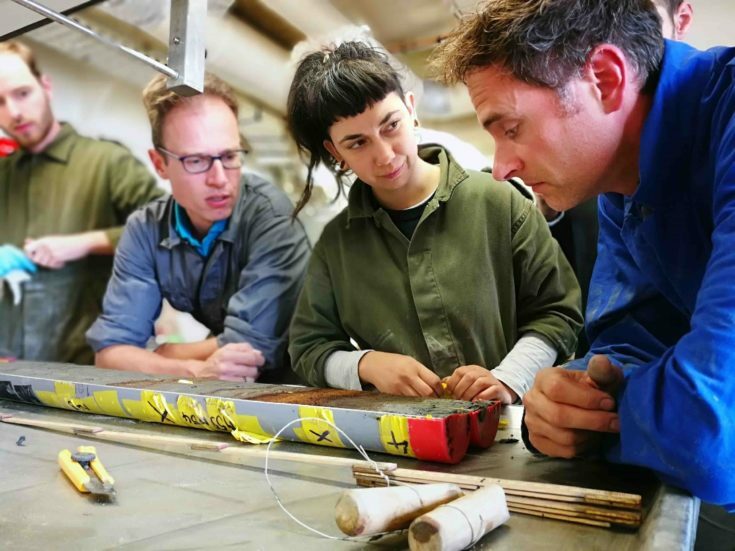 Researchers from TNO and Deltares also investigated the past of the North Sea during the expedition. To be more precise, a past when the North Sea was much smaller and large stretches were still dry land at the end of the last ice age. But sea level rose fast and the landscape transformed into a sea. But is history repeating itself? It seems so, because it is in the news almost every day: the rate of sea-level rise is accelerating and projections for the future become increasingly worrisome. A rise of several meters in the next century is not unthinkable anymore. But is this physically possible? Can ice sheets collapse so fast that sea level will rise with these rates? One way to test this is by looking at past rates of sea-level rise during earlier periods of rapid melting of ice sheets. The early Holocene, between 12.000-8.500 years ago, is such a period as the ice sheets of North-America and Fennoscandia were rapidly melting and sea level rose more than 30 m over a time interval of a few thousand years. In North West Europe this transformed the vast plain of Rhine-Thames-Doggerland into the present North Sea and drove the people living there to higher grounds. But how fast did sea-level rise, what does this tell us about possible future rates of sea-level rise and what was the impact on the local landscape? In 2017 we sailed out to several sites and cored the transition from terrestrial deposits (peat) to tidal deposits (clay and sand). By dating this transition and measuring the elevation it is possible to know where sea level stood at a certain point in time. In 2017 we gathered many samples between -50 and -40 m and a few around -25 m below the current mean sea level (MSL). This year, between June 22nd and July 2nd, we set out to fil the gap between -40 and -25 m MSL. A novelty this year is that we will visit a few hotspots of archaeology, namely the Brown Bank and the Doggerbank area. From both sites multiple flint and bone tools have been trawled by fishermen, but especially for the Brown Bank it is completely unclear where these finds come from. Earlier this year a team from Belgium and the UK gathered seismic data and in collaboration with them, we selected locations to core remnants of the landscape of these hunter-gatherers. Also the Doggerbank is rich in archaeology, so who knows what we will find there? The expedition proved very successful and we collected peat layers around -60 and -50 m MSL, but also between -40 and -30 m MSL. When all peat layers are analyzed, the resulting sea-level curve will be unique in the world and could tell us a great deal about possible rates of sea-level rise. And therefore also about the interaction between global climate, ice sheets and local sea level change.